We had a lot of fun during Volunteer Appreciation Week in April providing treats to the volunteers who worked with us each day. 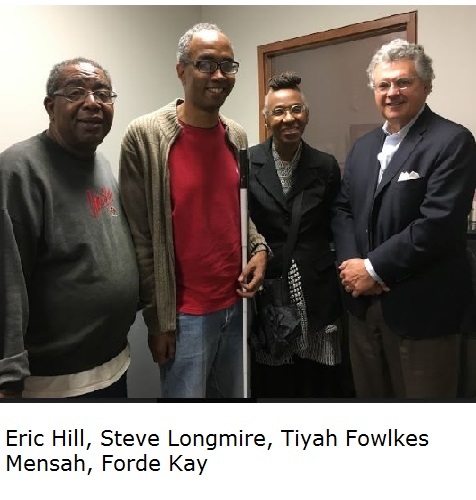 W e were also happy that Steve Longmire and Tiyah Fowlkes Mensah, two of our listeners, visited GaRRS to meet some of the volunteers and let them know how much they appreciate their time spent voicing programs. We love hearing from our listeners. The picture (above) is of Steve and Tiyah with Eric Hill (The Science Fiction Hour) and Forde Kay (Wall Street Journal). A big thanks to Steve and Tiyah for letting our volunteers know that their efforts are appreciated! In May we are fortunate to have two Eye On Blindness episodes. On May 24th Empish Thomas speaks with Barbara Harvey, author and advocate, about parenting. Barbara offers insights for parents with and without impairments as they care for children with and without impairments. Listen for this program on May 24th at 2:00 p.m. or listen on the archive page. Additionally, Carol McCullough returns with an Eye On Blindness episode where she talks about how blind runners participate in organized races. As part of the program, Carol interviews Trey McAfee who volunteers as a pilot runner in Houston, TX. You can listen to this special edition of Eye on Blindness on May 31st at 2:00 p.m.
GaRRS listener Joey Stuckey is a longtime resident of Macon, a musician, and an avid Braves fan. He studied classical guitar, has his own blues band aptly named the "Joey Stuckey Band," operates his own recording studios, and has released six studio albums. Joey lost his sight when he was eighteen months old because of a brain tumor. When Joey moved to Macon at 15, he discovered GaRRS which at the time was broadcast on Cox cable channel 99. GaRRS Producer Kevin Burnup invited Joey to visit the GaRRS offices in Macon where he was first able to investigate a studio environment. Joey credits GaRRS as being part of his journey to becoming a recording artist. Joey feels the most important thing that GaRRS provides is access to local newspapers. Even with all of the technology available for reading, newspapers and magazines can be tricky to read online because of the interruptions of graphs and advertising. Joey explained that readers lose the continuity of the articles. Instead, GaRRS provides an excellent narrator (not a robot) and a continuous reading of the articles without a lot of jumping around. Additionally, Joey believes that the advent of 24-hour news cycles have actually contributed to less local news delivery. Joey believes that GaRRS allows the listener to be an educated part of the community. You can listen to Joey's music and watch his videos online including a great music video for the song "Blind Man Driving." Betty Seeley began volunteering for GaRRS about ten years ago and currently reads the Christian Science Monitor and the weekly Food Ads. She has also read a book for Classic Books (O Pioneers! by Willa Cather) and has subbed for other programs in the past. Betty was a primary school teacher until she discovered that the librarian had the best job in the school system. She was then a school librarian for 36 years before she retired. In addition, she has served for many years as librarian for Canterbury Court and for her church. She also enjoys reading to children and shares that the secret to making them listen is to make them look you in the eye. Betty also takes classes with the Emory at Night program, is an avid student of historical architecture, and loves to travel. Thank you, Betty, for all you do for GaRRS! Please pay attention to the length of your recordings as each program has a target length. If you are not sure of the target for your program, check the guideline, the spreadsheet (with the tiny print) posted on the cork board over the black cabinet, or please ask. People stopping early--just not filling the required time. Note for Book Readers: The last episode of a book must be 58 minutes just like the other episodes. Please prepare material to fill that last hour. It can be information about the author or about the subject of the book. It can also be a short story by the author. If you are having trouble finding material, please let Cheryl or Jane know. Note to Recorded News Readers: If you find that you have worked through the guideline, and the last section does not have enough material, don't just stop. Say something like "We have time for one more news (or sports, or living) article" and then fill out the remaining time. Welcome to new GaRRS volunteer Moira Waldron; and welcome back to returning volunteers Laura Keyes and Carol McCullough (who has been out for recuperation and then some fun and relaxation). Please send thoughts and prayers to John Crean, Darlene French-White and Marty Kwatinetz. We wish you all speedy recoveries. Congratulations to the winners of the Volunteer Appreciation Week drawing: Nancy Naidu, Karen Scullion, Murray Friedman and Ricky Prior. Enjoy! Thank you to Suzanne Carey, Renee Ford Clark, Tracy Diehl, Ed Falso and Elizabeth Kimbrell for recording the proposed changes to GVRA policies. These changes are intended to support 2016 changes in federal law governing services provided to the blind. Some of our listeners sent 'Thank You' messages to GaRRS for making this information available. When you’re reading aloud you will find that it becomes easier to put all of your energy into the task at hand without the temptation of distractions. If you read the words aloud you may find deeper layers of meaning. When spoken, words take on a life of their own off of the written page and become part of you and inevitably, through comprehension, become part of your vocabulary and influence your use of language. People learn in a variety of ways--visual, aural, tactile and so on. By reading aloud, you’ll stand a better chance of internalizing the words and making them your own. If you are looking for an opportunity to stretch your imagination and explore the capabilities that may be hidden in your voice, read a children’s book aloud to someone you love. When people speak, we often involve more than just our voice in the projection process. In fact, many of us make use of our entire body when speaking to get a point across. When you read aloud there is hardly the opportunity to sound dull--especially if you have an audience. Make use of the full range of your voice. You’ll only be able to discover and explore it if you are speaking the words with the intention of them being heard. Lastly, reading aloud will make you more aware of things that you read and also help you to identify proper grammar and sentence structure. This was edited from voices.com – visit the website for the complete article. Out & About: This month's Out and About is Part 2 of Jody Franco's visit to FDR's Little White House in Warm Springs. Check out the conclusion of this trip on the Archive page of GaRRS' web site. Some readers have been experiencing issues with our recording computers, particularly with booth 4. Our computers have run more or less non-stop since 2006--much longer than one should reasonably expect. Good news! GaRRS is getting new computers for booths 1 - 5. The computers will be brand new, and there will no longer be cords on the floor to get tangled with your feet. The recording software and keypads will remain the same so there will be no need to relearn recording. Booth setup will also be a little easier for you, and people who read from a computer will find it easier as well as laptops will not be needed. We will replace the booth 4 computer first and provide the documentation and training you need. Books with a 2014 or earlier copyright are now in the 'for sale' book shelves. The Lending Library includes books aired in early 2017. Enjoy! With summer vacation season starting, we have a lot of one-time and short-term volunteer opportunities. Please check the red column in the Volunteer Calendar for current available slots. Call or email Cheryl Cabral (404-685-2823 or ccabral@garrs.org) if you are available for any of them. GaRRS is currently recording the revised Georgia Vocational Rehabilitation Agency Client Services Handbook. At seventeen pages long, the recorded handbook will be on the GVRA website as well as on the GaRRS website. Please call Jane if you would like to assist in reading or have questions about this effort. Visit our website, garrs.org, and make your secure donation today. 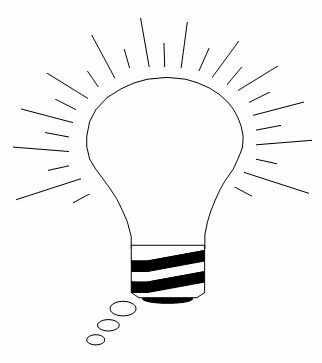 If you have any suggestions for future issues of this newsletter, please send them us by emailing info@garrs.org. Use "Newsletter Suggestion" as the subject line. Copyright © 2017 Georgia Radio Reading Service (GaRRS), All rights reserved.